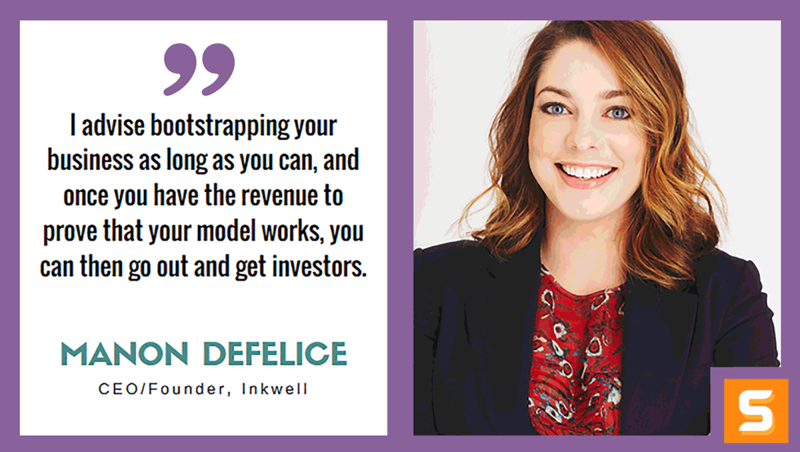 Manon M. DeFelice is the founder and CEO of Inkwell, a Connecticut-based startup that matches accomplished professional women with companies that need top talent on a flexible basis. She spent the last decade fighting for domestic abuse victims and sexually exploited children and served four of those years as the executive director of the AHA Foundation. There, she advocated on behalf of victims of honor violence, forced marriage, child marriage, and female genital mutilation (FGM) in the United States. While serving as an assistant counsel in Mayor Michael Bloomberg’s Office of Criminal Justice, she helped develop New York City’s first policies to address victims of human trafficking. In this interview with Startup Savant, Manon shares her entrepreneurial journey when forming the Inkwell team. She shares that her primary goal is to help rock-star moms who left the corporate world find suitable clients or jobs. She notes that networking always has been one of the keys in growing her business. Stay working in your day job as long as possible. While you still have a paycheck, build your website, tap your network, write your business plan— there’s a lot that you can do. Go to startup networking events to meet other entrepreneurs. Get to know more about Manon and the Inkwell team by following them on Twitter! What ignited the spark in you to start a business? Where did the idea for Inkwell come from? Like many businesses, mine started when I noticed a problem and came up with Inkwell as a way to solve it. The problem was that everywhere I looked, I saw highly accomplished women leaving the workforce after having children; the result was a brain drain—a loss of top talent from the workplace. Inkwell offers a solution: a way to connect people seeking flexible, rewarding work (think of all the rock-star moms that you know) with companies that need exceptional yet affordable talent. Both the women and the companies win. Networking is the ticket to reaching my ideal customer. I find nearly all of my best clients and candidates within my network of friends and connections; I tell everyone what I’m doing and ask people to refer me. I think it is as important to choose your clients wisely as it is to focus on your “product,” or in our case, candidates. One mistake we have made is taking on dead-end clients who have not been serious about our process, and who have taken time away from our active, paying clients. These customers lead us on a wild goose chase to find candidates they don’t have any intention of hiring—but we don’t get paid unless a company hires our candidates. Learning from this mistake, we can charge an upfront fee to avoid it. I would say my biggest fear is that I can’t bring Inkwell to its greatest potential—that someone else would do a better job. Yet when I look over my last three years with Inkwell and see our track record of success, I’m reassured that it’s going to be okay. At the same time, my fears can also motivate me to push harder, so I can use them to my advantage. Yes, I definitely recommend writing a business plan. Be sure to get help from someone who has experience (i.e., went to business school). You can hire someone through Inkwell—in just a few hours, they can lend you their skills to create a rock-solid business plan with real impact. Who has been your greatest influencer along your entrepreneurial journey? How did they shape Inkwell? Osman Kahn, CEO of the online art auction Paddle8, was my first big client, mentor, and advisor. He believed in my business model, and he helped me tweak it to make Inkwell more profitable as well as more desirable to potential clients. When I started Inkwell, I knew how it would benefit all the extraordinary women out there. Osman helped me see how companies could benefit too. Do you think having a professional look over your business finances or having a small business accounting software is important? If so, which do you recommend? I think both are important: You want to set your business up right from the beginning. At Inkwell we use QuickBooks, I also have a bookkeeper and a financial advisor who help make sure I’m doing everything right from both a tax and legal standpoint. You can use Inkwell to hire an expert who will set you on the right path. Have you faced any failures with Inkwell? How did you overcome it? I started Inkwell with the intention of helping people find greater work-life balance—but sometimes I don’t live that balance very well! I’m working on overcoming this by setting better boundaries and taking unplugged vacations with my family. It’s hard to have boundaries when it’s your own business and you are really invested in it. What do you do when you’re on vacation and a great opportunity comes through? Keeping boundaries, and knowing when to let them go, is an ongoing challenge. Your business model should be designed to make money from the beginning—this is the best advice that I have followed. The goal of a small business is to be profitable from the get-go. Rather than raise money and attract investors up front, I chose to bootstrap Inkwell. I reinvested the money Inkwell made back into the company. The idea is to grow your business organically; you don’t want to hemorrhage money along the way. I advise bootstrapping your business as long as you can, and once you have the revenue to prove that your model works, you can then go out and get investors. Is there a type of marketing that has worked amazingly for Inkwell? If so, how did you stumble upon it? Again, I’d say networking has been my best platform for growing my business; I don’t really do much marketing. You have to hustle yourself into the right room—and then make the most of that opportunity. If you can attract press, that is great too. What advice would you give to aspiring entrepreneurs in New York who have a business idea but don’t know where to get started? Stay working in your day job as long as possible. You can do a lot of preliminary work before you quit your job, while you still have a paycheck. Build your website, tap your network, write your business plan—there’s a lot that you can do. Go to startup networking events to meet other entrepreneurs. For women in New York, I recommend Dreamers // Doers – it’s a membership community with a newsletter and a Facebook page where you can post questions. There are a lot of great resources out there for would-be entrepreneurs who are motivated and inspired.